On a night when Matt Rafferty and Andrew Brown became the winningest players in Furman basketball history, Rafferty contributed in many different ways. In other words, it was just a typical night for the senior captain. Rafferty had 15 points, 11 rebounds, six assists, six steals and just one turnover as the Paladins defeated Chattanooga 73-58. While Furman's widely considered part of the "big four" in the Southern Conference this season, the Paladins were actually in fifth place a game behind the Mocs entering Thursday. 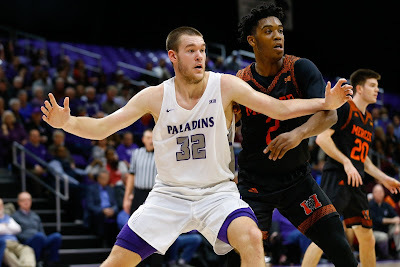 But Furman (16-4, 5-3) got off to a hot start with back-to-back 3-pointers by Alex Hunter and Noah Gurley in the first 47 seconds Thursday and never relinquished the lead. "I'm proud of our effort tonight. ... I thought we were complete in a lot of different phases, especially in the second half," Furman coach Bob Richey said. "This game plan was a little unique for us, but I thought we were really locked in." Despite not scoring over the final 4:30 of the first half, Furman took a 31-23 into the break. Rafferty and Gurley had 10 and 8 points, respectively, to lead the Paladins in the first half. Fellow post player Jalen Slawson had four steals, a 3-pointer, an assist and a blocked shot in nine minutes off the bench before halftime. That work by Furman's big men in the opening half helped loosen things up for others in the second half. Jordan Lyons opened the second half with a layup. Clay Mounce followed with a jumper and Hunter with a 3-pointer. That was a sign of things to come for all three. The Paladins never led by fewer than seven in a second half where: Lyons scored 13 of his game-high 18 points, Hunter scored nine of his 12 points and Mounce scored all eight of his points. "Matt and Noah did a great job coming out of the gate and being aggressive. For me personally, I was pressing just a little bit in the first half," Lyons said. "Coach Richey told me at halftime to just let it come to me and it will just flow. That really kind of calmed me down and allowed me to just get back in a rhythm (in the second half). "All of those 81 wins, Andrew and Matt deserve it. That class is really special and they're fearless leaders. They taught me a lot about work ethic and what it takes to win." Over its previous 15 games entering Thursday, Chattanooga made 40.4 percent of its 3-pointers averaging 10.2 makes per game in that stretch. Furman held the Mocs (10-11, 5-3) to 5-of-21 shooting (23.8 percent) from beyond the arc. The Paladins held Chattanooga's three leading scorers, Kevin Easley (15.1 points per game), Donovann Toatley (11.9 ppg) and Ramon Vila (11.8 ppg) to seven, three and six points, respectively. The Mocs' 58 points was their lowest scoring output since an 83-55 loss at Michigan on Nov. 23. "I thought we made a conscious effort to be where we needed to be and play with active hands. I thought that was a huge key," Richey said. "We had 35 deflections tonight and anytime we've gotten more than 30, we've won this year." Gurley finished with 10 points as Furman had four scorers in double figures. Andrew Brown had five points. While he hasn't been on the team as long as Rafferty and Brown, it was fitting that fellow senior Brady Schuck got in the scoring column on this special night. His two free throws with 45 seconds left wrapped up the game scoring. The win gave the senior class of 2019 a career record of 81-42 to surpass the win total of the 1980 senior class (80-37). "What else can you say about that? ... I still remember when Matt committed on his visit. We were playing Mercer and it wasn't like this program was busting at the seams at the time. You could see progress, but you couldn't see necessarily a clear light of where it was headed," Richey said. "For him and Andrew, Jalen (Williams) and Jonathan Jean to come in here in that (recruiting) class, first of all they're all great people. "When you talk about Matt and Andrew ... those two are obsessed with 'whatever it takes to win a game, that's what I'm here to do.' ... There's just a huge desire to compete and to win at all costs ... with whatever their role entails. That takes a special person. It's never been about 'what do I get out of this.' ... It's all about 'we've got to win,' and they're going to be able to say nobody has ever won more games." It was the 10th double-double of the season for Rafferty, who also pushed his season steal total to 54. That matches his total from last season and puts him 10 away from the school's single-season record of 64 set by Guilherme Da Luz in 2002. "This is a special place. I've never been a part of something like this. The guys, the coaches - everyone in this building is special," Rafferty said of the wins record. "That's how we did it."